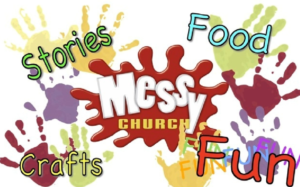 Join us for Messy Church! Created for children and their families, Messy Church is 2 hours of craft, stories, and songs centred around a different Biblical theme each month. Messy Church finishes with a communal supper, designed with kids in mind. Messy Church is an easy and fun way to introduce your children to the Good News of the Gospel. Haven’t got kids of your own? Why not bring your grandies, nieces or nephews? First Sunday of each month (except January and July, school holidays). Messy Church is free but donations are gratefully accepted, to help cover the cost of materials.